Senior Care Resident Spotlight: Pat B. 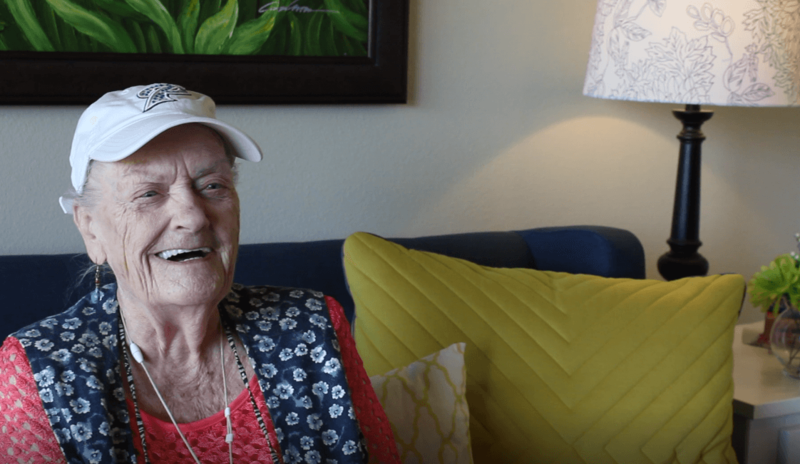 This month’s Renaissance Village Murrieta senior care resident spotlight is Pat B. You can always count on Pat for a good conversation and laugh or two. This sweet resident enjoys people watching and talking any troubles away. Pat was born in Oceanside, New York and spent most of her youth living with a foster family. They never let her call them mom and dad, it was always aunt and uncle. She lived with them until she was in the 4th grade. Then she lived with her biological parents and her older siblings. She had two older brothers, George and Norman, and a sister named Joan. Life was rough at times living with her parents. Pat wishes that she would’ve been able to stay with her foster parents longer. Growing up her family moved every couple of years. She lived in Belmar, New Jersey until 3rd grade when they made the move to Maine. Upon entering high school, she moved back to Belmar, and then went she got married she moved once more back to Maine. She met her first husband, Francis, when she was in high school. He and his friends were taking sledge hammers to his car before they came to junk it right next to where she lived. She remembers getting a laugh out of all the commotion that was going on. Francis also served in the United States Army. They shipped him off to Japan four weeks before their oldest son, Kevin, was born. He didn’t get to see him until he was 15 months old, which was typical of the time. Francis and Pat had three more children, Mark, Pamela and Steven. The two had always discussed eventually moving to California. However, when that time came Pat was against it and didn’t want to go. They had an argument, and she hid the fact that she cried all the way to California from her family. Upon arriving in California, Pat’s demeanor and feelings toward the move changed. She fell in love with California, and to her dismay the same happened with her husband. He wanted to move back to the east coast as he believe it was a mistake, but she felt otherwise. They ended up staying in California, but the two divorced. Pat originally worked as a nurse, but she had a hard time dealing with death. It bothered her so much, one evening she quit in the middle of the night and told them she wasn’t coming back. She went on to work for 21 years for at an investment company. The oversaw five corporations, dealt with real estates, apartments, leasing and loans. Pat found it interesting hard work and enjoyed it. She looks back proudly on the work they accomplished. When she and Francis divorced she did her best to make ends meet. She would sometimes work several jobs a day, even working through the night. Each of her kids also worked for Jack in the Box as teenagers. She always tells the kids they all raised each other through the hard work they each shared. Pat’s oldest son retired from a corporate position. Her second son is a commission for California. He works within the boxing industry and really enjoys the field. He also teaches at one of the colleges in the area and works hard. Her daughter recently moved from up north to Southern California so she wasn’t far from her family. Lastly, her youngest son worked for UPS for a little over 30 years. She’s proud of each of them and knows she did a good job raising them. She shares that they were very fortunate and have come out even better because of all the things they’ve faced. Pat feels she was tougher on the kids than most mothers. She let the kids know they could come to her for anything but knew they wouldn’t. When they did, she gave insight from each angle, but encouraged them to make decisions themselves. Pat married a second time to a man named Fred. The two were together for 16 years before he passed away. The two were on the brink of facing divorce when he suddenly fell ill and passed away right in their home. Despite the problems she faced with both the men she married, she remembers the positives. Pat has 17 grandchildren and another 17 to 18 great-grandchildren. She wishes she was able to see them all more often. Three of the grandchildren are serving in the Army and she shares she talked them into it. In the long run of her life, Pat feels that she’s been very blessed. She enjoys living at Renaissance Village. Pat always tells those touring at every opportunity what a great place it is to live. She feels that it’s a great place for the age group, and whether you’re alone or with someone, there’s plenty of privacy. She likes how everyone sticks together and are there for one another through thick and thin.